Archaeologists get very excited when they find pieces of Lapita pottery. Why? Because the sequential depositing of potsherds (fragments of pottery) in an easterly direction across the island groups of the Pacific has become the pivotal evidence that tells the extraordinary story of the peopling of the vast Pacific Ocean. Pieces of the distinctive red-slipped pottery of the Lapita people have been recovered from sites spanning thousands of miles across the Pacific from the outer reaches of Southeast Asia, through the island groups often referred to as Micronesia and Melanesia, and into the central Pacific and Polynesia. Though Pacific Islanders have their own richly detailed historical accounts of the exploration of their “sea of islands,” European speculation about how and when the Pacific was populated began with James Cook and other European voyagers of the Enlightenment era (1700s).1 Theories based on thin historical conjecture proliferated in the late eighteenth and nineteenth centuries, often at odds with Islanders’ own knowledge systems. 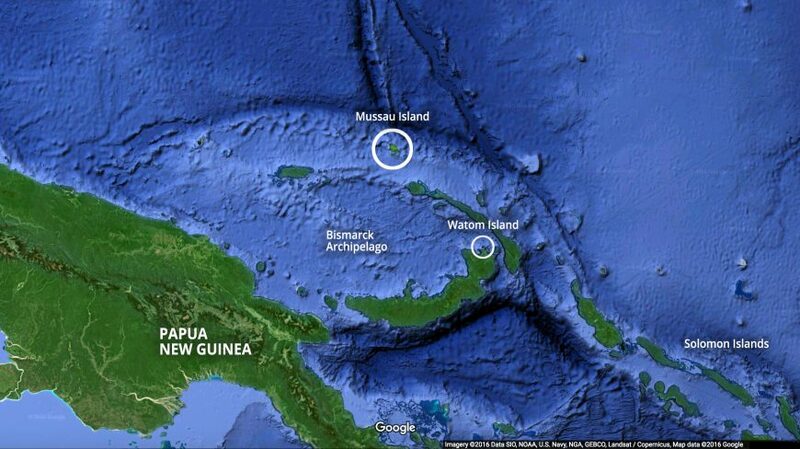 At first it was thought that the inhabitants of what is now known as Near Oceania colonized the islands southeast of the Solomon group, now referred to as Remote Oceania (see map below). It was not until archaeologists began to undertake stratigraphic archaeology in the Pacific from the 1950s onwards that this idea was debunked—mostly due to evidence provided by the multiple archaeological sites where Lapita pottery has been found. Archaeologists now believe that, somewhere between 4,000 and 3,500 years ago, a group of people who had sailed from the area around Taiwan in Southeast Asia arrived by canoe to the beaches of the Bismarck Archipelago. The new arrivals, who we now know as the Lapita people (named for the beach on the island of New Caledonia where a large number of pottery sherds were found), spoke a different language than the people they would have encountered there. These local people had been living on the large island now known as New Guinea and the surrounding islands for between 60,000 and 40,000 years.2 Aside from their language and different genetic stock, the Lapita were different to those they encountered because they had sophisticated seafaring and navigation capability—and they manufactured and decorated ceramics in very particular ways. We can only theorize about the political and environmental pressures that drove these people to set out to sea in search of new places to live. Nevertheless, the pieces of broken but stylistically related potsherds distributed across thousands of miles of islands, laid down in datable stratigraphic layers, have revealed important information about the ancestors of the contemporary peoples of the central Pacific. Lapita pottery was shaped by hand, and perhaps using a paddle-and-anvil technique to thin the walls, but without the aid of a potter’s wheel. It is low-fire earthenware (no evidence of Lapita kilns have been found). This means that the dry clay pots would likely have been placed in open fires to harden—the descendants of the Lapita people in Fiji and other areas still make pottery in this way. There is some geographical variation in the shapes and sizes of the pottery but most were simple bowls, some had pedestal feet, and others were flat-bottomed vessels. We know that the pottery was generally not used for cooking because carbon residues are not normally found on the potsherds. Rather, the evidence suggests that much of the pottery was used for serving food, while larger vessels were likely used for storage. The makers of the Lapita pottery blended clay with a particular type of sand. The sand was needed as a temper to make the vessels more durable during firing. Both the clay and sand are only found in certain areas of the Pacific. The islands in Remote Oceania are far less diverse in terms of geology than those in Near Oceania, and only a limited number of island locations had deposits of the clay used to make the pottery. Analysis of the composition of the sherds has revealed valuable information about where the raw materials came from. The archaeologist Terry Hunt has analyzed a large number of potsherds found by the archaeologist Patrick Kirch at Talepakemalai and other Mussau Lapita sites (see map above). The Mussau islands, which are mostly limestone, are one of the island groups with very little clay. Hunt showed that a large number of the potsherds found there had been made from materials brought from other places, indicating that either the raw materials or perhaps the pots themselves had been imported. This reveals that the Lapita people had the means and the need to travel and trade across significant ocean stretches—their “sea of islands.” Perhaps, the most remarkable thing about the Lapita pottery sherds is that despite the remaining sherds being found thousands of miles apart, they share a formal and discernible design grammar that archaeologists can analyze. In fact, it is the decoration of Lapita pottery that holds the greatest amount of information for archaeologists. The decoration of the pottery consists of stamped and incised motifs that adhere to a very regular, structured, and repeated set of specific patterns. The motifs were applied to the surface of the vessel with a small dentate (tooth-like) stamp and/or drawn free-hand with a sharp edge of some sort. The pattern stamps used included both linear and curved shapes of various lengths, as well as round forms. Once a pot was decorated, a paste of white coral lime was applied to the pattern which had the effect of making the delicate patterning stand out against the reddish-brown clay. Types of patterns range from simple to complex geometric forms, and include anthropomorphic face designs (image, top of page) found on Talepakemalai in the Mussau island group (see map above). The anthropomorphic pattern was a characteristic of early Lapita pottery, and is not present on pottery found in the upper (and therefore newer) archaeological layers of sites further east in Polynesia. A major breakthrough in the analysis of the Lapita design system came in the 1970s when Māori archaeologist Sydney Moko Mead developed a coherent formal system to categorize the design elements and motifs found on Lapita pottery. Mead’s system drew inspiration from linguistic analysis and has a set of components that form the building blocks of the “grammar” of the Lapita design system. These include: design elements, motifs, zone markers, and design fields. Even though the design system changed incrementally through time and within specific geographical areas as people moved across the Pacific, the underlying structural patterns and rules of the system remained the same. From an analytical point of view, the systemized grammar of design has meant that potsherds found in one site can be categorized and compared with others found in multiple other sites to provide evidence of the movement of the Lapita people in particular timeframes. What’s more, vestiges of the design motifs and the grammar of the system are apparent in contemporary tattooing, barkcloth decoration and other art forms throughout contemporary Remote Oceania (image above). As the Lapita people moved east past the Bismarck archipelago they likely reached the Samoan and Tongan Island groups around 800 B.C.E. They then paused for 1200 years when another phase of colonization began, and people headed toward the most distant reaches of the Polynesian triangle. People arrived in Hawai‘i by c. 1000 C.E., and Rapa Nui/Easter Island and Aotearoa/New Zealand by about 1200 C.E. For the most part, the further east the Lapita people headed, the simpler their patterns became. The most recent potsherds, found in the most easterly and south westerly locales, are minimally decorated. It seems that within a couple of hundred years of arriving in what are now Samoa and Tonga (see map above), Lapita pottery and its distinctive design decoration had all but disappeared. When Europeans arrived in the Pacific in the 1700s and 1800s, the ocean going long-distance seafaring canoes were gone, but the knowledge of distant islands and oral histories of voyaging remained. Archaeologists are still actively working to untangle the history of this early pottery, and with each successive discovery, to add to the extraordinary story of the Lapita people. 1 In his seminal essay “Our Sea of Islands,” Tongan scholar Epeli Hau’ofa asserted “There is a gulf of difference between viewing the Pacific Islands as ‘islands in a far sea” (as has been historically constructed by Europeans) to “a sea of islands.” Whereas the former emphasizes remoteness, the latter reinstates the ocean as a connector between all the people and islands of the Pacific; an oceanic highway in a region rich in resources. Epeli Hau’ofa, “Our Sea of Islands,” A New Oceania: Rediscovering Our Sea of Islands (Suva, Fiji: The University of the South Pacific, 1993), pp, 2-16. 3 Kirch 1997, p. 126. Patrick Vinton Kirch, “Peopling of the Pacific: A Holistic Anthropological Perspective,” Annual Review of Anthropology 39 (2010), pp. 131-148. Patrick Vinton Kirch, On the Road of the Winds: An Archaeological History of the Pacific Islands before European Contact (Berkeley: University of California Press, 2000). Patrick Vinton Kirch, The Lapita Peoples: Ancestors of the Oceanic World (Cambridge, Mass. : Blackwell, 1997). Cite this page as: Dr. Jane Horan, "Terracotta fragments, Lapita people," in Smarthistory, January 1, 2017, accessed April 21, 2019, https://smarthistory.org/lapita/.